This is a lovely and delicate cluster of icy pale green datolite is from Dal’negorsk, Russia and is 0.8 oz and 1.9” by 1.1” by 0.9”. She is elestial all over with cascading crystals of varying size. Her datolite is pale-pale glassine green with cool glyphs. 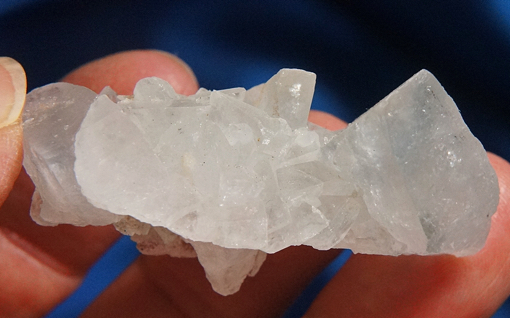 A loupe will show you the intricacy of expression the datolite that only enhances the incredible energy and Spirit of this amazing group of crystals. The green color comes from chromium “impurities” in this rare borosilicate and you will be stunned by her beauty and even more amazed by her energy! Datolite is a wonderful Spirit for dealing with change, particularly the understanding of why things happen the way they do. First, she provides a sense of history so that you understand the path of change through the millennia. Seeing WHAT has happened is important – there are deep lessons in it all! Secondly, she provides alternatives in change – in every road, there are forks, and often it is difficult to decide which will be the better path. Know that each offers different lessons and that truly, there is never a bad choice since there is always a lesson to be taken from the travel. And lastly, she helps you realize that it is not just the goal to be savored, but also the journey. She facilitates astral travel, but with an important addition: we can remember where we have been and can bring back the significance of the journey. Her laser crystals show you that within this all, your Self is the source of your true power (and not the power that comes from riches, politics or position, but strength, confidence and Self-love). She is indeed an opening to the angelic realms, bringing in critical higher guidance and love. This Spirit indeed, helps you embrace the splendor of all that you do and follow in this lifetime, celebrating the steps as you go!